Maybe…The only small detail is that the majority of the deputies of the Greek Parliament do not believe that the Agreement is so good. Not only did the parties of the Opposition declare that they oppose the Agreement and won’t ratify it but even AN.EL., the junior partner of SYRIZA in the government says that it will vote NO when it is introduced in Parliament. The population does not believe it either. 70% of those asked in the polls, including 50% of the SYRIZA voters, answered they are against the Agreement. The Opposition asked the Government to hold a vote in Parliament on the Agreement before Mr. Tsipras and Mr.Kotzias, the Foreign Minister, sign it. The Government refused the request and also refused the calls for a Referendum coming from many sides and personalities, including Mikis Theodorakis, the legendary symbol of the International Leftist movement. But no, Tsipras and Kotzias presume to know better what is good for the people than the people themselves. Given the official opposition of the parties commanding the majority of deputies of the Parliament, the clear opposition of the people and other circumstances which we will try to elucidate, the signing of the Agreement between Mr. Tsipras and the Prime Minister of FYROM, Mr. Zaev, was nothing less than a political, if not a legal -stricto senso- coup d’ etat against the Greek constitutional order and the principles of Popular and National Sovereignty, with the sole aim of opening the way for FYROM to join NATO and the EU -and this irrespective of the opinion one may hold of the Agreement itself. As we said, everybody can have an opinion about this Agreement (*). But there is a much larger and probably far more important question than how to solve the dispute between Greece and FYROM. And this question is: Who rules Greece and FYROM? Their citizens and elected Parliaments, or US, Germany, NATO and the EU? Mr. Kotzias and Mr. Tsipras arguably may have had technically the right to sign this Agreement, but they did not have any legitimacy to do so, as the Greek political parties commanding a majority of deputies in the Greek Parliament have expressed their disagreement with it in the most official way. A closer look at the Agreement will persuade anyone that instead of solving, it seals and perpetuates the existing differences between Greeks and Macedonian Slavs. The main aim of the Agreement is to open the way for FYROM to join NATO and then, the differences of the two nations will be used to provide the US with a permanent tool to use the one nation against the other. The Agreement was conceived to facilitate US-NATO advanced strategic planning for controlling the Balkans by encircling, containing and threatening Russia. The Agreement has also the potential of destabilizing and provoking much greater instability, conflicts and chaos in the region, including in Greece itself. In addition to the problems outlined above concerning the Greek side there are also doubts whether Mr. Zaev himself, who came into power in 2016, as a result of a ‘color revolution’ greatly helped by US Secret Services, has also sufficient legitimization to sign this Agreement. Only by a series of ‘legal’ coups d’ etat and flagrant violations of the most elementary democratic and parliamentarian rules and procedures, which we will expose in detail, Tsipras and Kotzias were able to sign this Agreement. Of course, such massive violations of democratic rules and legitimacy in a member of the EU do not constitute an obstacle for Federica Mogherini, the EU Representative on Foreign and Security Policy, the EU Commissioner on Enlargement Johannes Hahn, Rosemary DiCarlo, the Deputy General Secretary of the UN and Mathew Nimetz, the UN special Envoy, who were present and celebrated the signing of the Agreement by the lake Prespes, an agreement reflecting the will of the Empire, not the will of the two nations involved. The only reason Tsipras and Kotzias hastened to sign this Agreement, essentially flouting of the Greek Constitutional Order, with the help of a EU Commission ever eager to attack democratic principles in any member state, is their willingness to satisfy everything that NATO and the US demand of them, something which they also do in all spheres of Foreign and Defense Policy (***). The main difference between now and 2015 is that the leading role is now played by the US and NATO. The European Union is relegated to a backstage supporting role, the opposite of what happened in 2015. In 2015 American diplomacy also played an important backstage role in the signing of the Greek capitulation and the Greek Vice-Premier, Mr Dragasakis even went on record to thank the US Administration for its vital contribution to the … surrender of his own government! The supposed “radical left” (SYRIZA) and supposed “radical right” (AN.EL.) were apparently unable to capitulate by themselves and needed outside help even for that! We said that this new coup d’etat is the continuation of the previous one, because both are included in the project of destroying the Greek nation and Democracy, by turning the Greek state into a western protectorate in all fields, including foreign and defense policies. 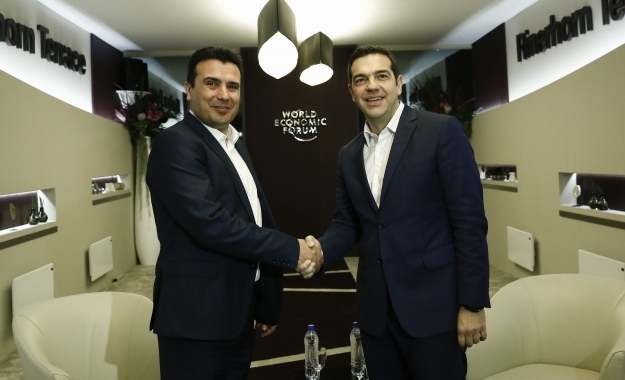 The Tsipras – Zaev Agreement marks the transition from the economic to the geopolitical colonization of Greece.